After ten weeks of traveling, we settled in for a long stay at my favorite spot in Italy: the Amalfi Coast. 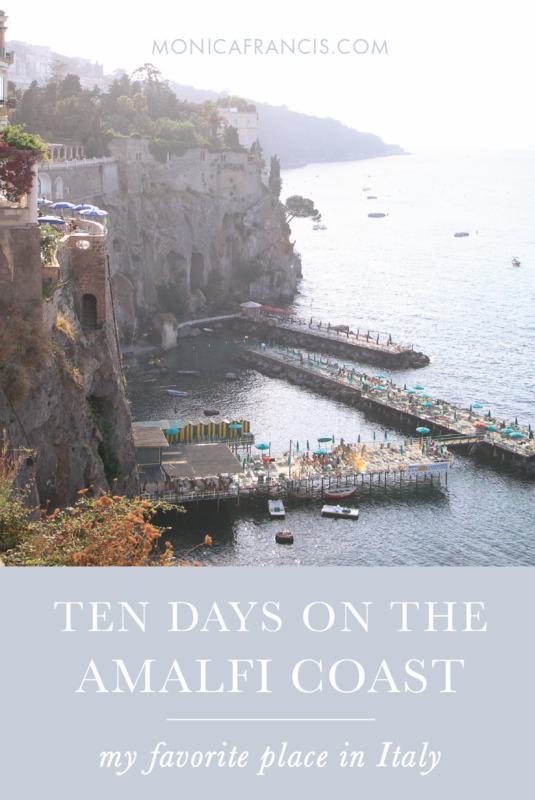 The landscape of zig-zagging cliffs dropping into the sea stretches from the Gulf of Naples to the Gulf of Salerno. Even after days of sailing along the coastline it seems like a mythical place - so it's not surprising to learn that the fabled Sirens of the Odyssey sang here, on a set of rocky islands just off the coast of Positano. Visiting in August, we found ourselves among a crush of vacationers, both foreign and Italian. While we wouldn't take back a day of our stay, we would plan a return trip for September - when the sea is still warm from summer and the vacationers are slowly clearing out for the season. Any time of year, you'll find that getting to the Amalfi Coast takes a bit more time and planning than other destinations. Depending where you're coming from, fly or take a train into Naples. From there, I recommend booking a private car and driver for the hour-long journey to Positano - it's possible to take a series of buses and/or ferries instead, but after an already-long day of travel with your luggage in tow, it's worth the €100 in my book. Plus, your driver will make a stop or two for photos as you take in that captivating landscape for the first time. We chose this colourful town as our base for the trip, like many travelers do. Its central location, enchanting atmosphere, and great restaurants make it well worth the prices. If you're looking for a less expensive town with a more local feel, try nearby Praiano. You could also spend a few nights in Capri or Ravello to really soak in each place. Wherever you stay, try to pack lightly. Between all the great shopping you'll find and all the stairs you'll climb, it's worth the effort to whittle down what's in your suitcase. While you could rent a scooter or ride the public buses from town to town during your stay, being based in Positano means easy access to the summer ferry boats that run all along the coast each day. Even when a ferry gets full, the ride is still beautiful, relaxing, and cheap. And I'd much rather be relaxing with a cool breeze than navigating all those hairpin turns. In Positano, it's hard to find any particular place that doesn't have a pretty view of colorful houses stacked up the cliffside, down to the tiled duomo and the sea below. Our wonderful vacation rental, Casa Gabi, had the sort of view no one would ever be ready to leave. Click here to read my full guide to Positano including favorite beaches, restaurants, and aperitivo spots. Sorrento makes an incredible first impression, with the city built up to the very edge of the cliffs that drop sharply into the harbour. While it's probably the first town you'll see on the Amalfi Coast, most visitors just pass through on their way to Positano or Capri. Instead, make the time for a day trip here, catching the 40-minute ferry from Positano (your boat might stop in Capri along the way). If you want to spend four or five hours exploring Pompeii, it's just a 30-minute train ride from the center of Sorrento. A bit more modern and metropolitain than the other towns on this list, Sorrento has plenty to see and eat that you won't find elsewhere along the coast. Make your way into the main town square, Piazza Tasso, and spend a while people watching from a cafe. When you're ready to move on, wander the maze of narrow back streets in Old Sorrento, where you'll stumble upon all kinds of restaurants, private homes, artisans' shops, and luxury hotels. And don't skip the street food - from limoncello gelato to Queen's Chips (yes, fries in Italy! ), it's not to be missed. After exploring the city for a couple hours, I was surprised to turn around and see this abandoned mill than I had saved on Pinterest years before. Evening in Sorrento has its own sort of magic, with incredible sunset views and no shortage of wine bars and restaurants. My choice would be the Grand Hotel Excelsior Vittoria's vine-covered champagne bar La Pergola, followed by dinner at Ristorante Donna Sofia (named for Sofia Loren) - or maybe just a cone of fries from Queen's Chips. Because the ferry boats don't run at night, plan to take a taxi for the 25-minute ride back to Positano. From Positano, catch a 45-minute ferry out to this stylish island - and don't worry about the long commute, because the views along the way are stunning. After watching the colorful vintage cars scooting around the harbor, make your way up to Capri town and promptly buy a lemon granita from the stand in the square (you won't regret it). Catch an open-air taxi up to Anacapri, and take the Monte Solaro chairlift to the top of the mountain for fantastic views over the island and the Sorrento peninsula. In the afternoon, take a gozzo boat tour around the island, or lounge Slim Aarons-style at La Fontelina Beach Club. For more to do, see, and eat on the island of Capri, read my travel guide here. The namesake of the Amalfi Coastline, this city was once a bustling maritime republic and home to a celebrated paper-making industry. Today it thrives on tourism, and being a 30-minute ferry ride from Positano makes it a perfect day trip. Amalfi can quickly feel more crowded than its neighboring towns, as everyone is funneled into the the main square, Piazza del Duomo. Admire the striped cathedral and its magnificent bronze doors (though Siena's duomo is still my favorite), then weave your way into the quieter back streets to wander for a while. Stop for a famous lemon-cream cake (delizie al limone) at Pasticceria Panza, and honor Amalfi's tradition of handcrafted papers with a visit to the stationery shop La Scuderia del Duca. When you need a break from the crowds, walk the footpath over to the neighboring fishing village Atrani. From the handful of pastel buildings to the umbrella-lined beach, it covers less than .08 miles, making it the smallest community in Italy. Between its size and its picturesque appeal, it's a perfect candidate for a postage stamp - and the perfect spot for a long, late lunch at A' Pranza. Perched high above the Amalfi coastline, Ravello is incredibly romantic. After a 30-minute ferry ride from Positano to Amalfi, catch a bus or taxi to reach this hilltop town. It has the charm and beauty of other coastal towns, but with breathtaking views at every turn and far less tourists. Add in the Italian castles-turned-luxury-hotels, and it's little wonder that this place was the setting for several famous 20th century affairs. Even if you're not on a honeymoon, a day trip here is a must. Find my guide to Ravello's castle gardens and delicious food right here.